WATER, CREAM, CHEESE BASE (PROCESSED CHEESE, WATER, SKIM MILK, CANOLA OIL, PALMOIL, MODIFIED MILK INGREDIENTS, SODIUM PHOSPHATE, SALT, PAPRIKA EXTRACT, ANNATTO), CHEDDARCHEESE, ROASTED GREEN CHILLIES, ROASTED POBLANO CHILI PEPPERS, TOMATILLOS, BUTTERNUTSQUASH, BUTTER, SOUR CREAM PRODUCT (MILK, CREAM, MODIFIED CORN STARCH, MODIFIED MILKINGREDIENT, BACTERIAL CULTURE, SODIUM PHOSPHATE, GUAR GUM, CALCIUM SULPHATE, CARRAGEENAN,CAROB BEAN GUM), ROASTED ONIONS, CORN MASA (CORN, WATER, CALCIUM HYDROXIDE), MODIFIED CORNSTARCH, TORTILLA CHIPS (CORN, WATER, COTTONSEED, CORN AND/OR PALM OILS, CALCIUM HYDROXIDE),SALT, GREEN ONIONS, SUGAR, YEAST EXTRACT, ROASTED GARLIC, CILANTRO, LIME JUICE CONCENTRATE,CHIPOTLE ADOBO PURÉE (DRIED CHIPOTLE PEPPERS, WATER, ONION, TOMATO PASTE, CANOLA OIL, SUGAR,VINEGAR, SALT, GARLIC, SMOKE FLAVOUR, SPICES), SPICES. 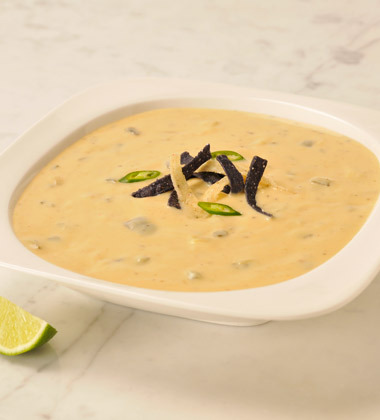 Fire-roasted poblanos, green chilies and tangy tomatillos complement the rich blend of mild white Cheddar and sweet cream, finished with a refreshing squeeze of lime. Heat to 70°C (160°F) and hold for serving. Stir often. Do not dilute. Keep frozen at 0°F (-18°C) or below. Thaw pouches (35–40°F / 2–4°C) for up to 15 days.